The UK's Most Dangerous Drivers - How Did Your Region Do? Did you know that 92% of UK drivers would class themselves as a “good” driver? But which areas of the UK should you avoid if you don’t want to bump into the remaining 8%? We compared average accident rates and licence points data to find out where the best and worst drivers in the country really live. Scotland’s drivers are among the worst, and best, drivers in the UK, our study found. The Scottish county of Kinross-shire may be small in size but is in fact a hotspot for dangerous drivers in the country. With a rate of 18 accidents per 1,000 people – the highest in our study – Kinross-shire is exposed as one of the worst places to take to the road. Other Scottish drivers with a less than perfect record include those from Dumfriesshire (2nd worst) and West Lothian (6th worst). In fact, the ten most dangerous places to drive are largely northern counties. No less than five of the top ten are in the northern part of the UK, with Cumbria in the north-west (4th worst) and Durham in the north-east (8th worst), completing the pack. Recent road casualty figures show that 191 people were killed on Scotland’s roads in 2016 – an increase of 14% from the previous year, illustrating just how much of a serious issue this is for the region. It is not all bad news for Scot’s drivers however. Orkney, off the coast of north east Scotland, has one of the lowest accident rates in the country (0.6 accidents per 1,000 people). When combined with low numbers of licence points the archipelago receives the accolade of being the UK’s safest county for drivers. Drivers in Flintshire in North-East Wales are sitting on the highest number of licence points in the whole of the UK, our research revealed. With an average of 7.8 points per licence, Flintshire is the 6th most dangerous area to drive. At the other end of the scale, Argyllshire and Renfrewshire in Scotland boast the lowest number of average licence points, with a much more respectable 3.5 points per person. Flintshire – take note! 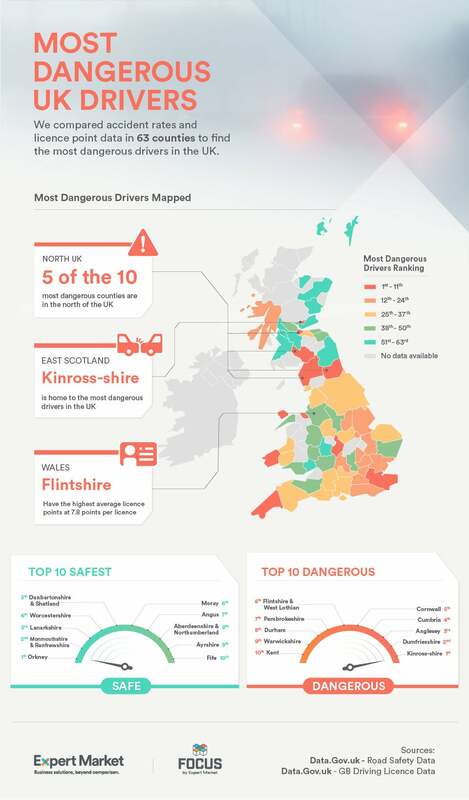 Check out the infographic below for more information on the best and worst drivers in the UK. Though compared to other countries the UK’s road safety standards are high, more can and should be done to ensure deaths and serious injuries are prevented. The rise of the smartphone has brought about a generation of drivers who are addicted to selfies, snapchats and instant messages. Research has proven time and time again that modern day gadgetry such as phones and tablets can increase distractions on the road, reduce reaction times and increase the chances of having an accident. On the other hand, technologies such as telematics and black box trackers are able to reduce accidents on our roads, though not enough of our drivers are currently using these. We hope that our research into the country’s most dangerous places to drive might raise awareness as to the dangers of being behind the wheel. If drivers can be dissuaded from giving in to the distractions of modern technology, a less dangerous road might lie ahead for us all!